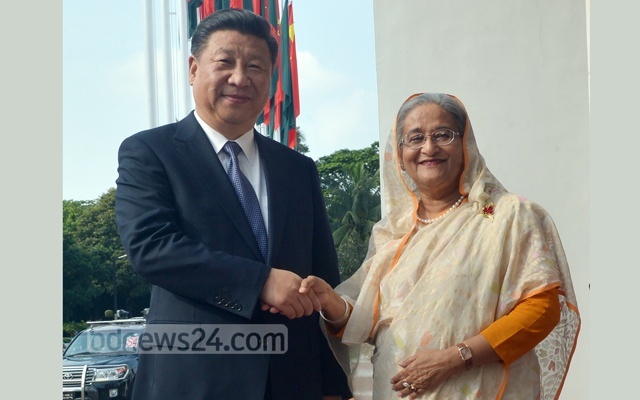 According to the joint statement issued on the visit, a MoU on the initiative was signed along with a number of deals in the presence of Xi and Prime Minister Sheikh Hasina after their official talks on Friday. They have also “elevated” their cooperation to “strategic partnership” and agreed to cooperate in all regional and international issues. Bangladesh is “appreciative” of China’s initiative, believing it will bring “important opportunities” for Bangladesh’s goal of becoming a middle-income country by 2021 and a Developed Country by 2041, according to the statement. They agreed “to enhance the alignment of the development strategies of the two countries, fully tap the potentials of cooperation in various areas, work on “the Belt and Road Initiative”, so as to realize sustainable development and common prosperity of the two countries". Apart from the Belt and Road Initiative, the two sides signed documents of cooperation in areas of industrial capacity building, power and energy, information and communication technology, investment, maritime cooperation, disaster management and cultural and people-to-people contacts. Introduced by Xi in 2O13, the Belt and Road initiative is the centerpiece of China’s economic diplomacy. China appears keen to invest in large infrastructure projects in foreign countries since the beginning of the belt and road initiative. 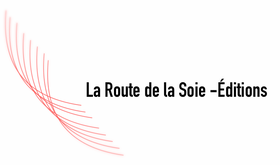 Under the initiative which comprises the Silk Road Economic Belt and the 21st Century Maritime Silk Road, China is focusing on building a trade and infrastructure network for connecting Asian countries with Europe and Africa along the ancient Silk Road routes. The aim is to boost development of other countries and their trade with China. Beijing is also working on a Bangladesh-China-India-Myanmar, or BCIM economic corridor, to connect South Asia with Southeast Asia. 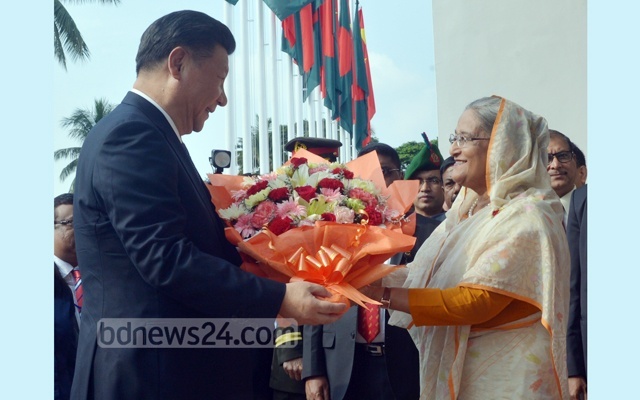 Xi arrived in Dhaka on Friday morning on a two-day state visit, first by a Chinese head of state in the past 3O years. Before his arrival, Beijing said the focus would be on pushing forward the framework within the belt and road initiative. He held meetings and talks with President Hamid, Prime Minister Hasina and Speaker Shirin Sharmin Chaudhury. Opposition BNP Chairperson Khaleda Zia also called on him at his hotel suite. 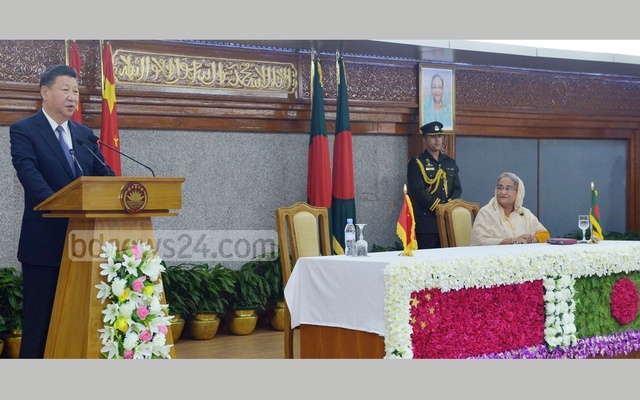 With Hasina, he witnessed the signing of 27 deals and unveiled plaques of six projects. Those, the prime minister later said, have created a platform of “our two countries to cooperate at a higher plane”. 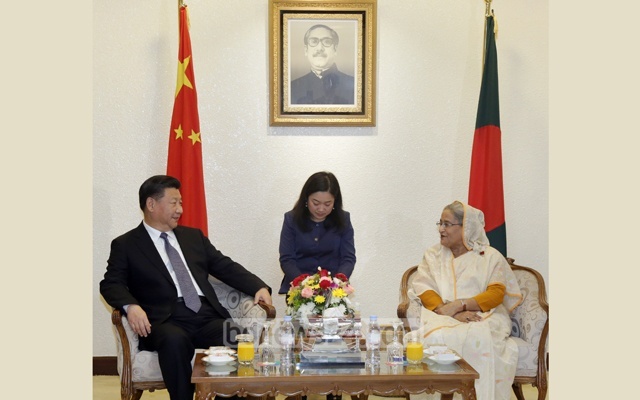 This visit has “ushered the traditional friendship between China and Bangladesh into a new era and bears significant historical importance to the bilateral relationship,” according to the statement. They expressed “satisfaction” at the “traditional” friendship and “fast development of bilateral cooperation”. The two sides agreed to maintain military cooperation and exchanges at various levels and deepen cooperation in areas such as personnel training, equipment and technology and the UN peacekeeping missions. Both nations condemned terrorism in all its forms and manifestations. The Chinese conveyed their support to Bangladesh’s efforts in combating terrorism and maintaining national security and stability. They expressed readiness to cooperate through sharing of information, capacity building and training with Bangladeshi, according to the statement. Both countries vowed to work together for the common development and prosperity which are conducive to the improvement of the welfare of the two peoples. They will promote the development of the region and the self-relied growth of developing countries. “Based on the common aspiration for and the bright future of the cooperation between the two countries, both sides agreed to elevate the bilateral relations to the Strategic Partnership of Cooperation,” read the joint statement. Beijing appreciated Dhaka's commitment to one China policy and its support on issues related to China's core interests and its efforts to safeguard its national sovereignty and territorial integrity. Bangladesh thanked China for the "support for its efforts in maintaining national independence and sovereignty and realizing national stability and development". The two sides agreed to enhance high-level exchanges, maintain frequent contacts between leaders of the two countries on the sidelines of multilateral fora. They also expressed their satisfaction at the positive progress made in a number of projects such as 1320 MW Payra thermal power plant, construction of multi-lane tunnel under the river Karnaphuli, Dahserkandi Sewerage Treatment Plant, procurement of six vessels, Padma Bridge, IV Tier National Data Centre. The Chinese side agreed to consider and encourage Chinese Enterprises to explore cooperation on the 22 projects proposed by the Bangladeshi side in power, ICT, river management, infrastructure and other areas on the basis of equality and mutual benefit. The two sides expressed happiness at the signing of the Framework Agreement for Developing Cooperation on Production Capacity between Bangladesh and China. They also agreed to jointly work for developing and investing in the ICT sector. The further agreed to continue their cooperation on river management, including dredging with land reclamation. The two sides will start feasibility studies on the establishment of China-Bangladesh Free Trade Area. China will continue to encourage and support competent Chinese enterprises to invest and build Economic & Industrial Zones in Bangladesh. Dhaka will facilitate and support Chinese enterprises doing business in Bangladesh. The two sides believed that there are extensive potentials for cooperation in maritime affairs between the two countries, and agreed to establish a dialogue mechanism for maritime cooperation. The Chinese side will continue to provide training courses to Bangladeshi professionals in fields such as public administration, science and technology, agriculture, health care, arts, and help the Bangladeshi side to develop professional training in Bangladesh. Beijing will train 500 Chinese-language teachers for Bangladesh, train 100 Bangladeshi cultural professionals, and invite 600 Bangladeshi students to visit China from 2016 to 2020. 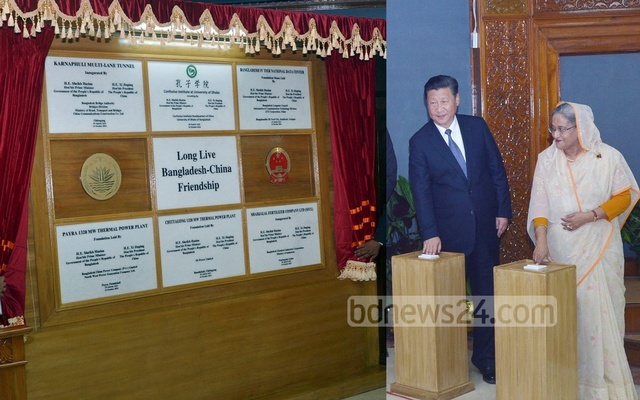 They announced the year 2017 as the “Year of Friendship and Exchanges” between China and Bangladesh.